Luring a dog behavior is a positive dog training technique you can use to teach your pet basic and fun obedience cues and tricks. This methods is fast and does not involve any pushing around. I like to start my dog training classes teaching this method because anyone can do it and is fun for the dog too. Luring a dog behavior is the best technique for beginners because your pet will happily follow you and it doesn't require a lot of skill, although some practice will improve your efficiency. This method was popularized by renowned dog trainer Dr. Ian Dunbar and is one of the best positive techniques to start training a family pet dog. It is even easy enough for most kids to try with their canine friend. Dogs are opportunists. What does that mean? It means good news for you! It means that they will eat pretty much anything they can and when they can. That is why Luring a dog behavior works! 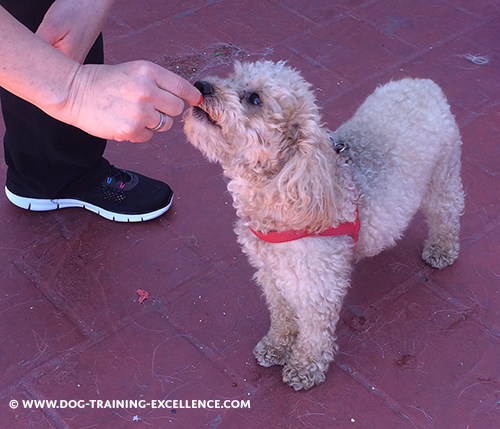 You can use food to your advantage and teach your dog many things simply by following your hand/treat. Grab a piece of Yummy dog treat. Then without letting go of the treat, but letting your pooch lick it a little bit...move your hand slowly around. When you get the behavior you wanted, Mark and Treat!! Note that even though you are using a treat as both a lure and a reward, a lure is used to produce a behavior but a reward is used to reinforce the behavior. A reward is given after the behavior is done! Did your dog follow your hand? Good! 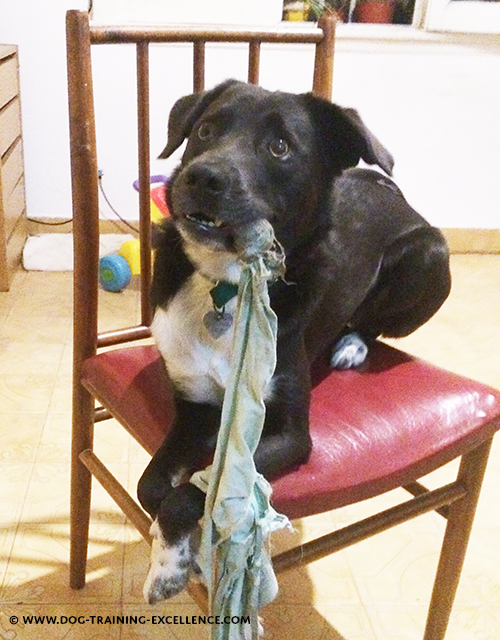 What can I teach my dog with luring? Lure your dog into a sit! Move the treat up towards your dog's eyes, very slowly. You will notice that he will sit as his head goes up (and his bottom goes down). Yes! mark and treat! He deserves it! Lure your dog into a down! Start with the dog in a sitting position. Move the treat down to the floor, slowly. Your pooch will follow the treat down and might just plop down all the way. Yes! mark and treat! He deserves it! Lure your dog to roll-over! With your dog in a down position, move the treat to the side of his head slowly until he turns all around. Mark and treat! Lure your dog "off" the furniture! Instead of pushing your dog out of the furniture (or yelling and getting upset). Use a treat to lure your dog off the furniture. Mark and reward as soon as he is off! 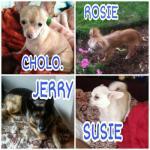 You may need to teach your dog to stay in his own bed or another alternative to prevent him from using your furniture. Luring a dog behavior is a basic method to start training your pet. 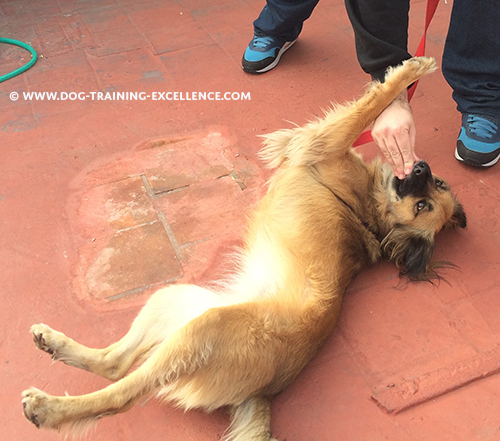 Luring a dog behavior should only be used the first 3-5 repetitions you start training a new command. 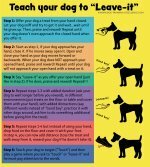 Then, you need to "fade the lure"; this means to teach your dog to follow your empty hand. Eventually your -empty- hand movement will become a hand signal. After that, switch to Capturing or use a hand signal or verbal cue to elicit the behavior. Move the treat up, towards your dog's eyes, very slowly. You will notice that he will sit as his head goes up (and his bottom goes down). Yes! Mark and treat! He deserves it! Repeat steps 1-3, three times. The fourth/fifth time do the same without the treat in your hand! (but your hand still smells good so your canine friend will follow it). Use the non-treat lure more often (i.e. : treat, no-treat, no-treat, treat) until you completely fade the lure away. Change the luring movement of your arm into a hand-signal. The hand signal usually derives from the luring movement of your arm. So in this case it could be if you start with your hand down (palm facing out) move your hand towards your shoulder bending your elbow doing so. From now on prompt your dog with the hand signal only. Give him a reward every time he responds to your cue and ignore him if he sits without you doing the hand signal. When do I use Luring? To get your dog's attention! You are out on a walk and your tail-wagger friend sees a running squirrel. Instead of yelling and choking to prevent him to react, use a lure! Have the BEST yummy treat you can find, put it right under his nose and happily try to distract him away. 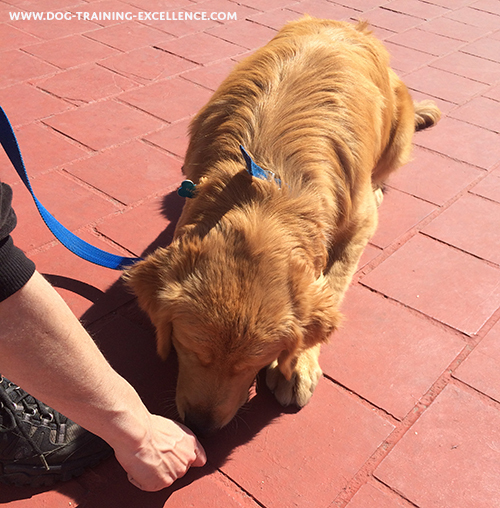 Important: release the treat to your dog ONLY after he is paying attention to you! Do not feed him while he is still interested in the squirrel or you will be rewarding him for the opposite of what you wanted to! Caution: If you use a lure to get your dog's attention too much, your dog will learn that no matter what you say, he can wait until you come and put a treat under his nose. Using a lure to get your dog's attention should only be used sporadically and in critical situations. My dog doesn't follow the food in my hand! Try moving your hand slowly. If you move it too fast the animal can't follow and will loose interest or try to bite it off your hand! The treat you are using might not be "good enough". Experiment with different treats to find the ones that get your dog excited! (pieces of chicken, cheese, cat treats - the size of the treat should be about half of your fingernail!). My dog is not motivated by food! Try using toys! Small and squeaky! You can also teach your dog to touch your hand or another item and then use this as the lure. This is called target training. If luring is not working for you...don't worry! There is more to learn! Capturing might be the right technique for you. If I use a treat to get him to do something...it's a bribe! Answer: Not really. The word bribe is typically associated with having someone do an illegal or dishonest act. You are just trying to get your pet to be well mannered. That way the whole family can live in harmony! Answer: This is NOT true. If you follow the advice on this website you will get a well behaved dog that can and will respond even if you do not have a treat with you! 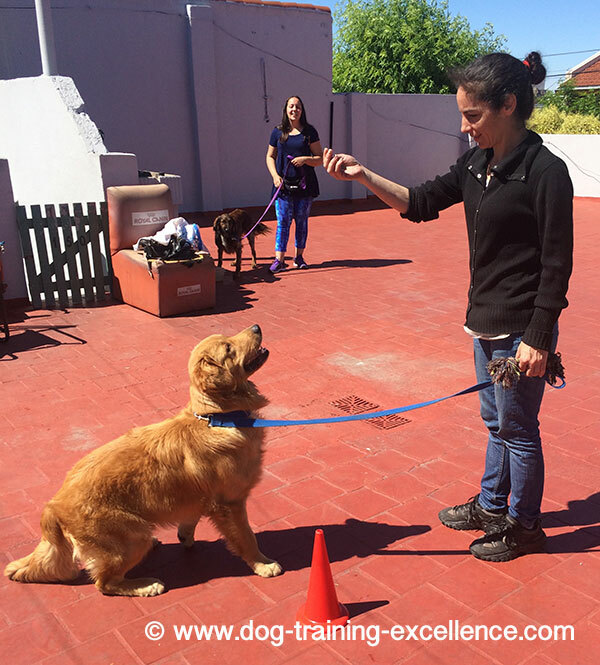 Read "How to Use Training Treats Correctly" article for more information. Answer: This can be true. The only drawback will be that your dog will take a little longer to figure out why he is getting rewarded. I recommend using luring for basic behaviors like sit, down, stand, etc. But complex behaviors might need to be trained with a different method like Capturing. Click to learn more about Capturing! 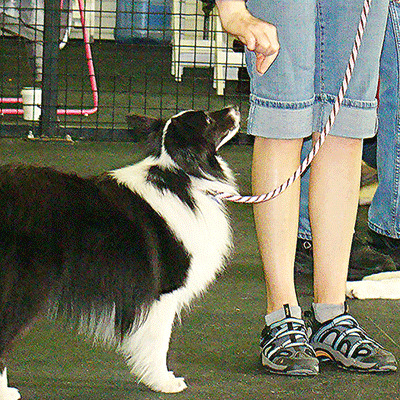 Luring a dog behavior is a positive training technique.